The cold and rainy spring in the unheated greenhouse thwarted our first attempts to grow transplantable vegetable and herbal seedlings in April and May. Undaunted, and with the help of Martine and Janice,we abandoned our miniature and unhealthy starts and planted Martine’s new seedlings. By mid June we were inundated with fresh herbs and furthermore, as of today we have harvested many varieties of tomatoes from Leo and Rosemarie’s starts, cucumbers from seeds , more herbs and are awaiting the ripening of seeded watermelon and cantaloupe. 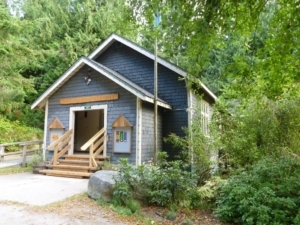 At present, we are meeting on Wednesday mornings at 10 at the greenhouse which is located on the Galiano Community School grounds. Because the seniors’ soup garden and the school garden are in close proximity, we also interact with their activities. if you are curious, you are welcome to check us out! The registration fee of $20 per season covers the cost of seeds and any miscellaneous gardening necessities. For further information, please contact the Food Program at galianofoodprograms@gmail.com or phone 250-539-2175, option 2. In August, Bob Boyechko and his crew removed 2 old roofs from the South Galiano Community Hall and replaced them with a new roof. The work took about 5 days during the hottest week of the year. No rot was found under the old roofs and the new roof was expertly installed along with new flashings. At the same time the roof was being re-done, Louis Gonthier re-coated the main Hall floor and the stage floor. Louis spent 4 days working on the floors and donated all of his labour costs. Thank you to the Community for your support through the purchase of “shingles” and attending various fundraising events, to all who volunteered to help with the sprucing up of the Hall, to Don Anderson for re-building the front steps, to Ken Hancock, Capital Regional District Director, for his financial support of this large project, to Galiano Trading for their equipment loan, to Dave Gerlach for the loan of his truck and finally to Kathy Benger whose very generous donation of $6,000 allowed us to proceed this summer with this project. 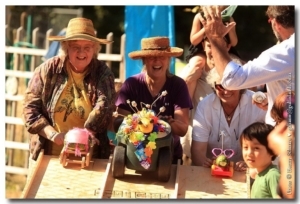 Everyone is invited to Galiano’s first annual Zany Zucchini Races that will be held at the Community Picnic on September 25th at the School/Activity Centre. Ret. Captain Thomas Schnare is co-ordinating the exciting races that will be judged by Mike Hoebel and Dave Agnes. There will be age categories and the rules are that . 1) “Cars” must be constructed with a zucchini, the width of the Zucchini “car” at its fattest point can be no more than 13 inches wide. Length, wheel sizes and weight are not restricted. 2)All power will be supplied by an incline ramp. 3)Awards in the following categories: for 12 & under, 18 & under, and over 18. 4)Award for the most creative vehicle. Sunday September 25th from 1-4pm. 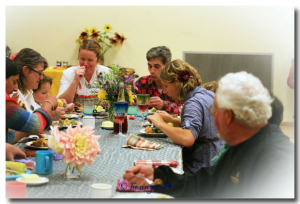 Gather at the School/Activity centre with friends and neighbours to celebrate the harvest. Potluck lunch starts at 2pm. This year there will also be a Pie Baking contest (bring your best pie to take home the ribbon!) plus Zucchini races (just find your biggest zucchini, add wheels and line up at the start line! ), live music from talented locals and a kids vs. parents soccer game. Bring your own plates and cutlery to make clean up easier. So far the following organizations are participating: Library Society, Galiano Naturalists, Chamber of Commerce, Parks & Rec, Lions Club, Galiano Club, Emergency Prepardness Committee, Health Care Society, Galiano Community Food Program and Parents Advisory Committee, Galiano Playgroup Society, North Galiano Fire Protection Society, North Galiano Community Association, Activity Centre plus a number of individuals. But we still need a few more volunteers to help with this fun event. The fruit trees planted on Galiano by the early settlers are, many generations later, still bearing fruit and providing an opportunity for the community to get together and glean. The dictionary defines glean as: to pick up or to gather. But on Galiano, it is so much more than that. Here gleaning is about sharing the bounty. 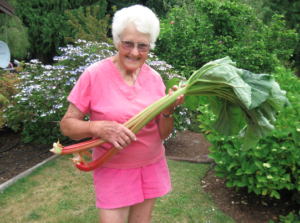 This is the third year that the Galiano Community Food Program has coordinated the gleaning project which to date includes rhubarb, plums, apples, potatoes and kiwi from a couple of dozen properties and which is greatly appreciated by all the participants. Volunteers respond to a call to help harvest the fruit or vegetables at a donor’s property; date and time are arranged and an enthusiastic group arrives with ladders, boxes, baskets, bags and kids in tow to assist in the harvest. In the case of fruit trees, ladders are strategically placed and everyone finds their comfort zone; up the ladder, climbing the tree or on terra firma picking the fruit on lower branches. Soon the busy pickers are chatting, tasting and planning different ways to use the fruit. Many hands make light work, so it is amazing how quickly the boxes get filled. When we see all the boxes full of fruit, we are in awe of the bounty a single tree can provide. The harvest is then shared among the gleaners, the property owner, the Food Program and sometimes the Food Bank. Often, the gleaners are unable to identify specific apples or plums as many of them are heritage varieties. To help us with this The United Way of Victoria has given us a small grant to identify and label the fruit bearing trees on Galiano with the participating property owners and the Community School. In the case of potatoes, Lisa and Roger Pettit of Galiano Sunshine Farm and Tom and Henny Schnare of Cable Bay Farm, can identify all the varieties they grow for themselves and for the Community Food Program’s gleaning project. 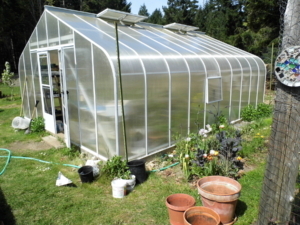 The gleaning project is one part of the Community Food Program’s goal of food security on Galiano. Food Security was the theme of a forum on Hornby Island called The Hornby Forum on Food and Farming. Jane Wolverton and Cedana Bourne of the Food Program attended and one message they brought back to us was to plant fruit and nut trees for future generations. Part of this project was completed with the expanded garden at the school and the raised beds built this past summer by Leo Engelmann and Richard Nathans. New fencing and a new gate was put up by Patrick Sherry and Leo. The vegetables being grown in the raised beds will be used for the Soup for Seniors’ initiative. Another part of this project involves elders working with the school children to identify and inventory the fruit trees and orchards on the island. The kids will be involved in mapping the locations of orchards, helping to identify trees, investigating the history and culture of fruit trees on Galiano. In the Spring we will use this information to do some grafting workshops and ensure that the magnificent fruit trees on the island are “re-born”. 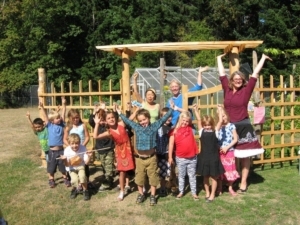 This project is being funded by the United Way of Greater Victoria.